2 skeins “Edition 3.0” in color #2301 Taupunkt/ Dew Point from Schoppel Wolle, 100% virgin wool, 150 m = 164 yds/ 50g = 1.76 ounces. 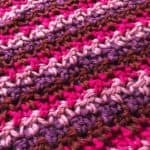 Use a stretchy yarn that gives you the gauge below and is made from woolen fiber. 28 sts x 18 rnds to 4″ / 10 cm with US 4 / 3.5 mm needles in lace and cable pattern after blocking. 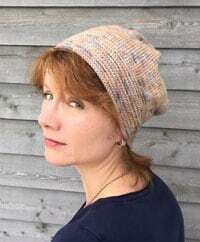 Knitted bottom-up in rounds, preferably with circulars. 24″ / 40 cm circulars US 4/ metric size 3.5 mm. 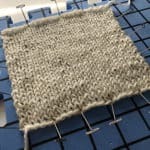 Stitch marker or waste yarn to mark beginning of round. 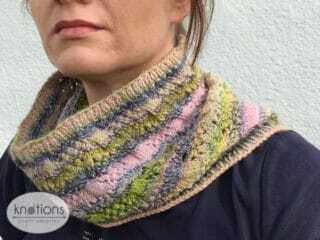 Child S, 18″ / 45.5 cm cowl circumference, 7.25″ / 18.5 cm cowl height. 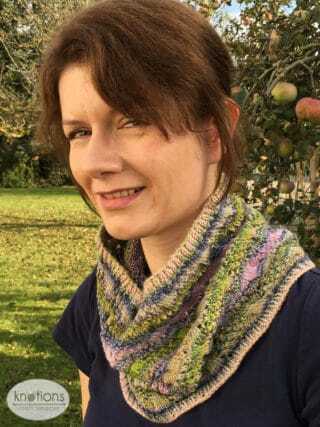 Child L, 20.25″ / 51.5 cm cowl circumference, 8.75″ / 22 cm cowl height. 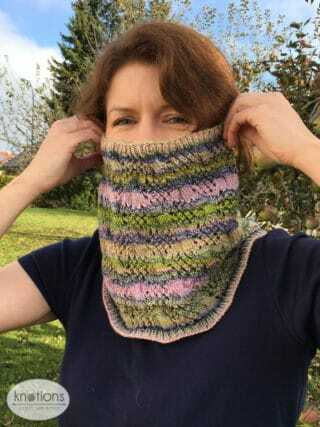 Adult L, 22.5″ / 57 cm cowl circumference, 10″ /25.5 cm cowl height. 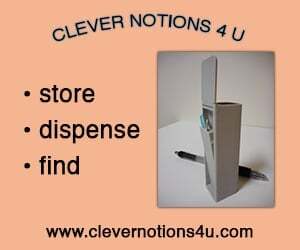 Rnd 1: *(Yo, ssk) 4 times, k8; rep from * around. Rnd 2: *K, (yo, ssk) 3 times, k9; rep from * around. Rnd 3: Repeat rnd 1. Rnd 4: *K, (yo, ssk) 3 times, k1, 4/4 LC; rep from * around. Rnd 5: Repeat rnd 1. Rnd 6: Repeat rnd 2. Rnd 7: *K8, (yo, ssk) 4 times; rep from * around. Rnd 8: *K9, (yo, ssk) 3 times, k1; rep from * around. Rnd 9: Repeat rnd 7. Rnd 10: *4/4 LC, k1, (yo, ssk) 3 times, k1, rep from * around. Rnd 11: Repeat rnd 7. Rnd 12: Repeat rnd 8. 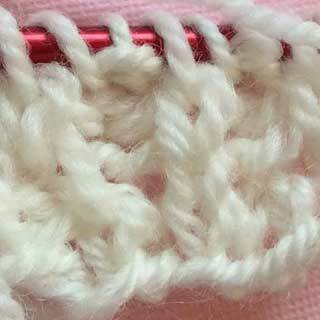 Repeat rnds 1 to 12 of lace and cable pattern 1 (2, 2) times. 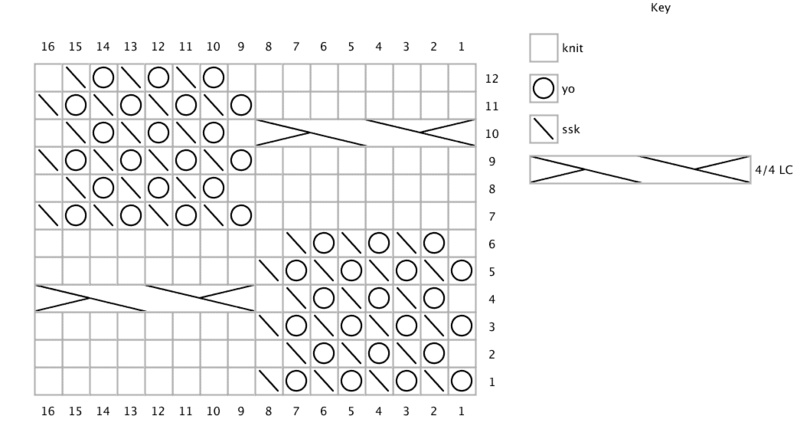 Repeat rnds 1 to 6 of lace and cable pattern 1 (0, 1) times. 4/4 LC: 4 over 4 left-leaning cable: sl 4 sts to cn, hold in front of work, k4, k4 from cn. 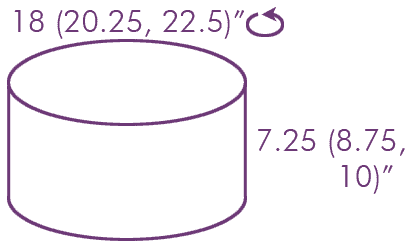 Numbers given are for smallest size, those for larger sizes are wrtitten in parenthesis. If there are no parenthesis, the number applies to all sizes. CO 128 (144, 160) sts using long-tail cast-on, pm, join to work in the rnd, being careful not to twist sts. Rnd 1: *K1, p1; rep from * around. Repeat above round 3 more times. 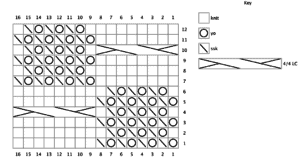 Work from chart or written instructions over next 30 (36, 42) rnds. Rnd 1: *K1, p1; repeat from * around. Bind off loosely all around. 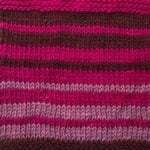 Cut working yarn and pull end through last st. Soak cowl in lukewarm water with wool detergent until completely wet. Rinse with clear water. Lay flat onto an old towel, roll up the towel and cowl and step onto it to remove excess water. Unroll and block to measurements. Let dry completely. Weave in ends. Put on and wait for spring. 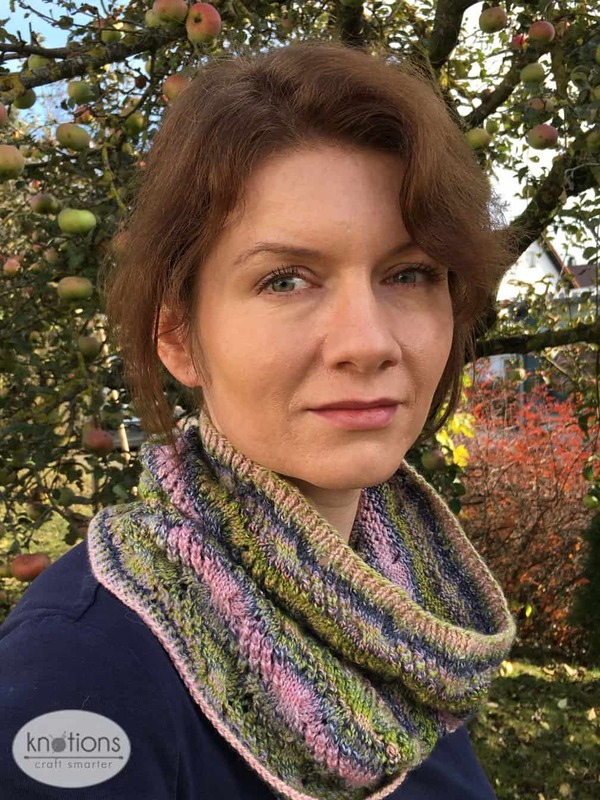 Linda Gaessler is a native Swabian from Baden Wuerttemberg in Southern Germany and an all-self-taught knitter. She started designing garments for her son when he was about 6 months old, and since then both boy and sweaters have grown. Her household also involves her husband and two cats, next to small bits of yarn. She has been published in KnitNow and I Like Knitting, and you can find her on Instagram, Facebook and Ravelry.